To swallow, as you might already know, means ‘to take something down the throat,’ such as food or drink. It is also used figuratively to mean ‘to accept without questioning’ or ‘to assimilate or absorb,’ in the latter sense, it is often followed by up. If you swallow an emotion, it means that you repress it, and if you swallow your words, that can either mean that you take back what you’ve just said, or that you mutter or pronounce words poorly. 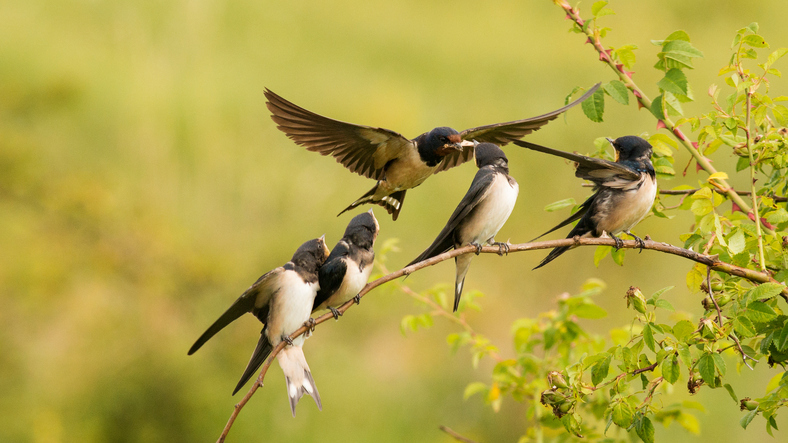 As a noun, a swallow is the amount swallowed at one time or the act of swallowing. On a completely different note, a swallow is a small, long-winged songbird known for its swift, graceful flight. You should always chew your food thoroughly before you swallow it. Sarah is so gullible; she'll swallow any tall tale you tell her. Ben watched Maggie walk away until the crowd swallowed her up and he couldn't see her anymore. Karen swallowed her anger and patiently explained what Ross had done wrong. The politician was forced to swallow his words when the journalist proved his assertion was not based on fact. Raphaël took a swallow of wine. We watched the swallows swooping over the meadow. To swallow, meaning ‘to ingest through the throat,’ dates back to before the year 1000. The Old English verb swelgan (to swallow, imbibe or absorb), which became the Middle English swalwen or swelwen, can be traced back to the Proto-Germanic swelgan or swelhan and the Proto-Indo-European root swel– (to eat or drink). It is related to the Old Saxon farswelgan and the Old Norse svelgja (to swallow), the Middle Dutch swelghen and Dutch zwelgen (to swallow or gulp), the Old High German swelahan (to swallow) and the German schwelgen (to revel), as well as the Iranian khvara– (eating). The noun swallow, meaning ‘the act of swallowing,’ dates back to the early 19th century, and comes from the verb. The noun existed much earlier though. Before the year 1000, the Old English noun geswelgh meant ‘gulf, whirlpool, abyss or hole in the earth,’ and later the Middle English swalwe also included the sense ‘throat or gullet.’ The noun then fell out of use until it came back in relation to the verb. Swallow, meaning the type of bird, dates back to before the year 900. The Old English noun swealwe (Middle English swalwe) can be traced back to the Proto-Germanic swalwon and the Proto-Indo-European root swol-wi, and is related to the Old Saxon, the Old Norse, Old Frisian and Swedish svala, the Danish svale, the Middle Dutch zwalewe, the Dutch zwaluw, the Old High German swalawa and the German Schwalbe (all meaning ‘swallow’), as well as the Russian solowej, the Slovak slavik and the Polish słowik (meaning ‘nightingale’).